When was the last time you put up a hem? For me it has been years! But I still have this lovely little metal seam gauge that I use on a regular basis. Not for hemming skirts but for weaving fused fabrics. 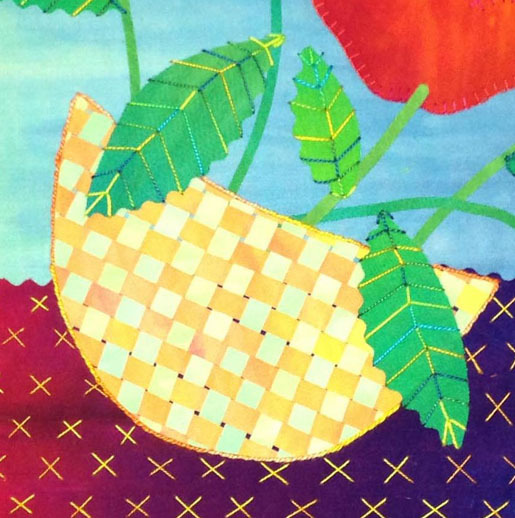 As a maker of fused appliqué quilts, I find that many sewing tools can be adapted to my needs. And the metal seam gauge is a good example. 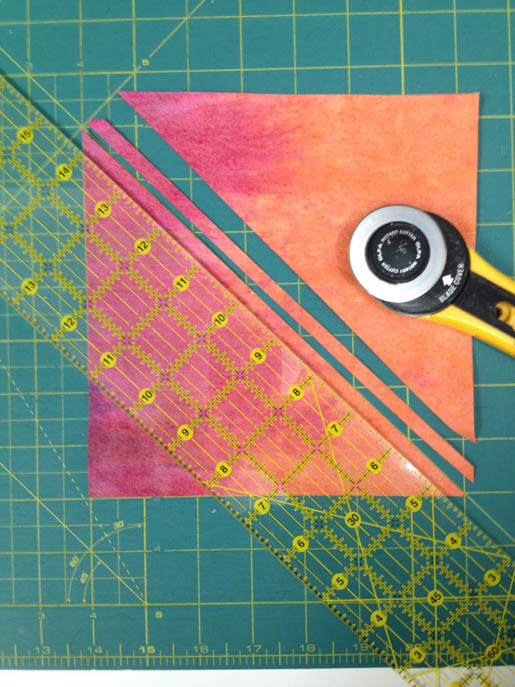 It is perfect for making woven collages. 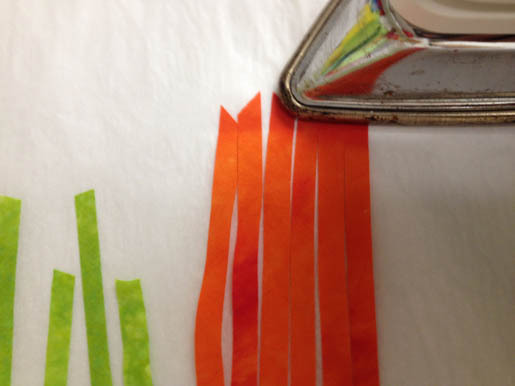 Apply fusible web to the 2 fabrics you want to weave. 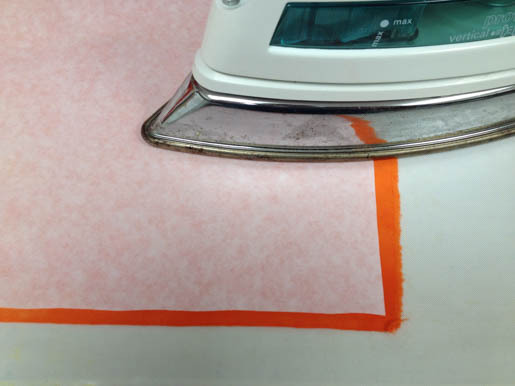 After the fabric cools, remove the paper and save it. This paper is called release paper. Select one color set of strips for the warp. 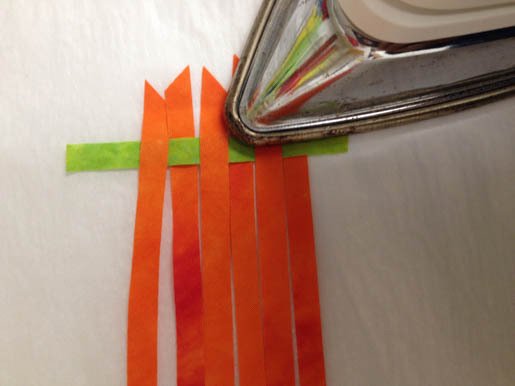 Line the warp strips next to each other onto release paper or a Teflon sheet. Fuse-tack just the ends of the strips onto the paper. 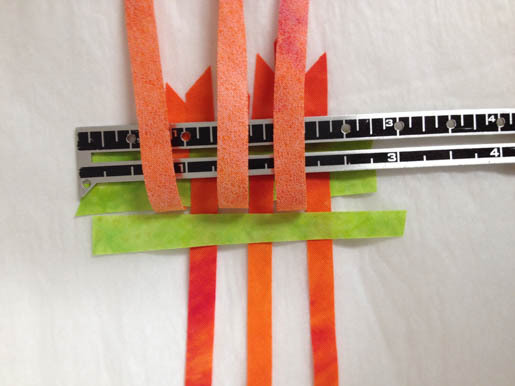 Place the metal seam gauge on the end of the warp and flip every other warp strip onto the ruler. 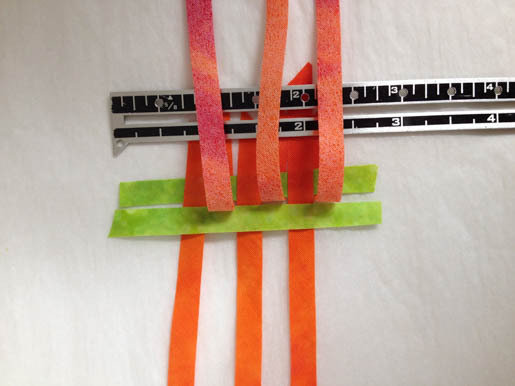 Place a strip of the other color across the warp (this is a weft strip). Flip the warp strips down into place on top of the weft strip. Fuse-tack into place just up to that weft strip. 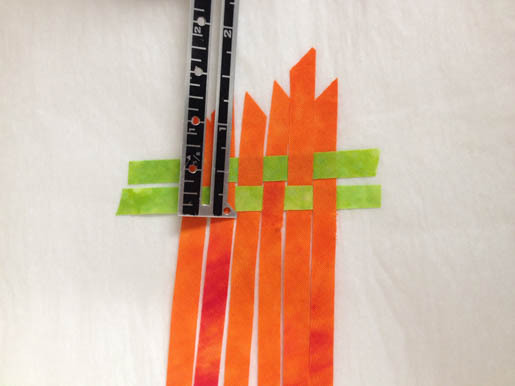 Flip the opposite warp strips on to the ruler. Place a weft strip across the warp. Flip the warp strips down into place on top of the weft strip. 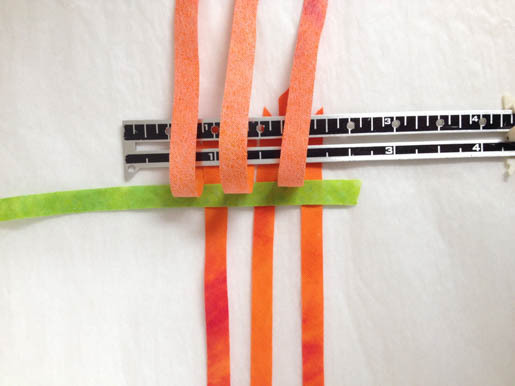 Use the little point on the ruler to tamp the weft strip into place. 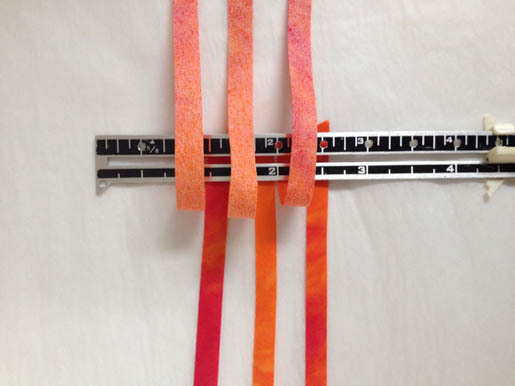 Repeat by flipping the opposite warp strips onto the ruler, slipping another weft into place, and flipping warp strips back and tamping into place before fuse tacking the weft into place. 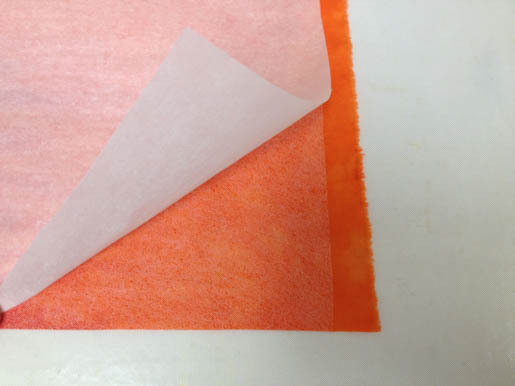 After you make your fused collage, remove it from the release paper. Cut it into a basket shape and you can use it for your next basket of flowers. 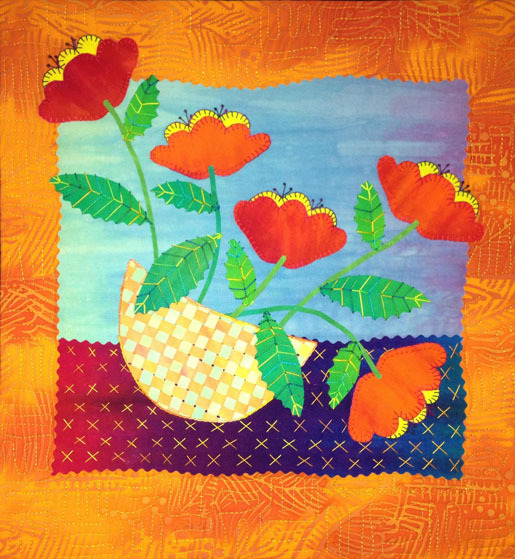 For more tips on making fused art quilts visit me on my blog arftfabrik.com. Previous Previous post: Help our Animal Friends in Times of Need by Doing What We Love!